The death of a Triple Canopy contractor in Iraq bears a striking resemblance to an earlier electrocution ruled to be a "negligent homicide." Photo provided by the Hermanson family. US Air Force Staff Sgt. 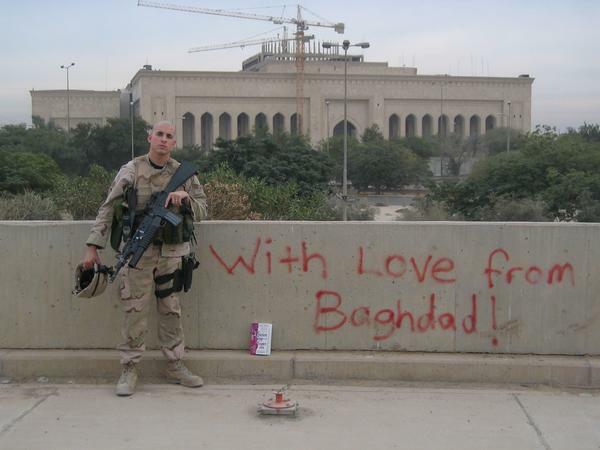 Adam Hermanson, pictured in Baghdad, Iraq, died Sept. 1. At the time he was working for Triple Canopy. Editor's note: A State Department spokesperson called The Nation shortly after this story was posted to say that Hermanson was working on a Defense Department contract at the time of his death. Adam Vernon Hermanson “was a natural-born leader,” according to his brother, Jesse. In 2002, just before his eighteenth birthday, Adam enlisted in the US military, armed with the required permission from his parents because he was not legally an adult. Adam spent six years in the Air Force. In all, he did three tours in Iraq and one in Uzbekistan. After he was honorably discharged from the military in early 2009 with the rank of staff sergeant, Hermanson took up employment as a private bodyguard in his hometown of Las Vegas, where, according to his family, he protected a wealthy individual. But according to Jesse, Adam was interested in returning to Iraq as a private military contractor. “He had been talking about it a lot; he was interested in Blackwater,” Jesse recalls. Earlier this week, Hermanson returned home on a flight to Dover Air Force Base in Delaware. His body was in a coffin. Hermanson was not killed by enemy fire or an improvised explosive device or even by “friendly fire.” In fact, he died in what is considered to be the safest place in Iraq for Americans–the heavily fortified Green Zone. His body, according to his family, was discovered on the floor of a shower near his quarters at Camp Olympia. It appears that Hermanson was electrocuted. Hermanson’s family suspects that Adam may have died as a result of faulty electrical wiring. And they have good reason to think that–at least sixteen US soldiers and two contractors have died from electrocution. The Pentagon’s largest contractor in Iraq, KBR (a former Halliburton subsidiary), has for months been at the center of a Congressional investigation into the electrocution deaths because the company has the massive LOGCAP contract and is responsible for almost all of the electrical wiring in US-run facilities in Iraq. The eighteen soldiers and contractors died as a result of KBR’s “shoddy work,” according to Senator Frank Lautenberg. As The Nation has previously reported, the Defense Department paid KBR more than $80 million in bonuses for contracts to install electrical wiring in Iraq. The award payments were for the very work that resulted in the electrocution deaths of US soldiers, according to Defense Department records. More than $30 million in bonuses were paid months after the death of Sgt. Ryan Maseth, a highly decorated 24-year-old Green Beret who was electrocuted while taking a shower at a US base in January 2008. His death, the result of improper grounding for a water pump, was classified by the Army Criminal Investigations Division as a “negligent homicide,” but the Pentagon recently announced there would be no criminal charges filed in the case. Two other soldiers who died from electrocution while showering are Navy Petty Officer Third Class David Cedergren and Army Cpl. Marcos Nolasco.